Our G-Spec 2-Piece Guidon Pole Sets are made to meet U.S. government specifications for durability and appearance. They are made from a light Ash wood and feature polished Brass or Chrome Army spears and matching bottom ferrules. They are available in 8Ft, 9Ft, and 10Ft lengths. They are NSN equivilent items. Guidon Poles are used to display organizational Flags such as Guidons or Unit Colors. They are available in a Brass or Chrome finish and come complete with the spade spear ornament that can unscrew to attach the optional battle streamer ring attachment. 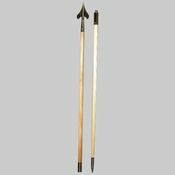 Guidon Pole sets are available with the standard pointed ferrule bottom or with a rounded bottom for displaying indoor in a standard indoor flagstand. 8Ft Poles- Used for displaying Organizational Flags 3x4Ft and 3x5Ft in size. 9.6Ft Poles- Used for displaying flags 4x6ft and 4'4" x 5'6" in size such as Armed Forces Departmental flags.